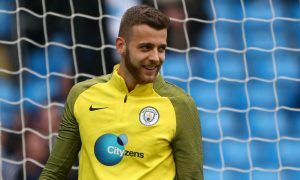 England under-21 goalkeeper Angus Gunn is on the verge of leaving Manchester City for Southampton for £10million, John Percy of the Telegraph reports. The news, also reported by Simon Stone of the BBC, follows up on a report from June that stated the clubs were discussing a £15million deal for the 22-year-old. Today’s reported fee is lower, although it is possible that it may be an initial £10million with add-ons increasing City’s income in future, but the deal is now close to happening. Gunn will provide competition for Alex McCarthy at Southampton. With Ederson firmly established as City’s number one, the Blues are ready to cash in on the highly-rated Gunn, but are likely insert a buy-back clause in any deal. The son of former Scotland goalkeeper Bryan Gunn, Angus has not made an appearance for the Manchester City first team, but appeared 51 times in an impressive loan spell at Norwich last season, which has led to Premier League interest.